Part of a travel insurance policy is medical evacuation insurance, and it’s something that people often overlook when they are traveling. 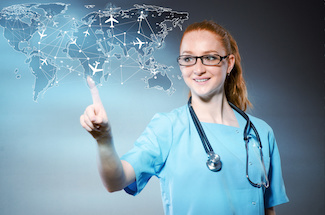 Whether they are going to remain within the United States or they are traveling farther away, medical evacuation insurance is something that needs to be considered. What Happens When People Become Injured While Away From Home? Travelers who fail to purchase trip insurance with medical evacuation coverage will receive a huge bill if they are injured or become sick while away and need to be transported by helicopter or airplane. For example, some areas within the United States are popular destinations for hiking, like Yosemite in California. it’s possible that hikers may fall in this remote area where it is difficult for ambulances to reach them. In the above scenario, the injured party may need to be evacuated by helicopter. In this case, it would only require about $50,000 for this trip. What if the person is simply enjoying a basic hike in Europe? The cost to be evacuated could be as much as $150,000. However, most people’s health insurance plans only cover illnesses and injuries that occur within the United States. Furthermore, their health plans may not pay for medical evacuation at all. This would mean that the hikers would be responsible for paying for their helicopter or airplane rides. How Does Medical Evacuation Insurance Help? The above-described nightmare does not have to happen if people purchase trip insurance before they leave home. Within a travel insurance package, they will have coverage in the event that they need to be transported to a medical facility after becoming injured or sick. Because people can purchase medical health insurance specifically for their trips, their medical treatment will also be covered under the trip insurance policy. Once injured or ill travelers are able to return home, they may need special equipment for the journey. Travel insurance will even cover this cost. In the event that travelers do not survive their injuries or their illnesses, their bodies will be transported back to their countries of origin. The cost will be paid by the repatriation coverage that is part of the insurance package. How Much Insurance Can People Purchase? People can put together a package that will cover all of their specific needs, including medical evacuation insurance. They also have the option of adding luggage protection, rental car protection and insurance against the possibility of needing to cancel or shorten the trip. If someone becomes injured or sick and the family needs to return home early, they will also want to have their pre-paid expenses reimbursed along with payment of their medical bills. A complete insurance package can cover all of these possible losses in just one policy.